A good number of reviewers mention that the outsole of the Adidas Light Em Up 2 does not have to be wiped frequently to maintain its traction. A lot of owners are amazed that these budget-friendly Adidas shoes have Bounce. Many buyers love the unique look of these basketball shoes from the Three Stripes; their asymmetrical design just make them stand out. Unlike most basketball shoes, the Light Em Up 2 does not squeak. Plenty of users leave comments saying that these high-top shoes do not need time to break in. The shoe is comfortable to use straight out of the box just like the fourth Klay Thompson Anta sneaker. The engineered mesh used on the upper comes as a surprise to most buyers because this textile is commonly used for more expensive shoe models. A number of reviewers suggest that the shoe be reserved for indoor use only. Outdoor courts can tear the soft rubber easily. The insole is paper thin according to several owners. They advise new buyers to replace it with a thicker insole for more cushion. According to some users, these Adidas basketball shoes are not true to size. It is recommended to go half a size down. Wearers say that Damian Lillard’s fifth shoe runs long as well. It is no surprise that the Adidas Light Em Up 2 is loved by many shoe owners. The Bounce technology in the midsole and the herringbone on the outsole work wonders during gameplay. The shoe model also does not disappoint when it comes to aesthetics. The asymmetrical design is out of the ordinary. 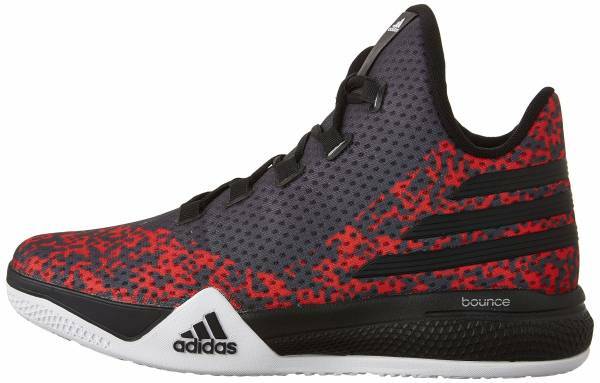 If you are searching for a new pair of basketball shoes, treat yourself to a new pair of the Adidas Light Em Up 2. Satisfaction is guaranteed without breaking the bank. This is an amazing shoe. I definitely would recommend this. Especially because of the price. Grades aside, I personally like the overall performance of the shoe, but that's just my preference. I cannot stress enough how great of deal this is, and much of a surprising one as well. The Light Em Up 2 of Adidas was released in March 2016. It is a well-cushioned shoe that weighs only 13.75 ounces. Sold for only $80, it is considered a budget shoe under the basketball category. The midsole is packed with Bounce. The outsole has herringbone, which is an approved go-to tread pattern by Adidas. Cushion. The responsiveness of the shoe comes from the Bounce technology in the midsole. For a budget shoe, this technology is considered a treat. It is a cushion that is designed to absorb impact. It also provides stability and balance to the foot without affecting the player’s speed. The foam is thick in the heel area and thin in the forefoot area, resulting in a good heel-to -toe transition for most athletes. Traction. The multidirectional herringbone pattern of the Adidas Light Em Up 2 delivers excellent traction. It is soft and pliable, making a good job with court grip and feel. The rubber outsole is designed not to attract dust, making the athlete’s court moves unstoppable. Length and Width. The Adidas Light Em Up 2 is said to be longer and wider than most shoe models currently in the market. A good number of testers suggest going half a size down to achieve a more comfortable fit. Some users prefer to stick to their size and wear double socks for a snug fit. Lockdown. The oval laces of the shoe can be adjusted to achieve the desired fit of the user. The wrap-around collar of the shoe secures the ankle well. The upper of the Adidas Light Em Up 2 is made of engineered mesh. Aside from keeping the feet well-ventilated, the material is soft enough to conform to the shape of the foot. The material is perforated for better ventilation. The collar has a thick padding to provide moderate ankle support. The insole for the shoe is quite thin compared to other shoe models. If more cushion is desired, it is recommended to add a sockliner. If court feel is preferred, the existing insole will be fine. The Adidas Light Em Up 2 is a mid-top shoe with a one-bootie construction. The design of each shoe is asymmetrical to each other. Instead of a typical movable tongue, the midfoot features a wraparound material. The shoelaces are looped in protruding eyelets. They come in different colors. The shoe model also comes in many different colorways. The famous Adidas stripes are located on the heel counter. The company callout and logo are located on top of the tongue and the lateral side of the shoe.